One of the most alluring regions in France, The French Riviera, or Cotê d’Azur, is known for its charming villages, captivating scenery, stunning beaches, Provencal culture and cuisine. Here you will find delicious food, fascinating history and culture, all combined with glamourous cities and towns, film festivals and even the Monaco Grand Prix. With warm sunny days pretty much all year round, there are lots of glorious golden beaches for you to explore along the coastline. Discover everything from the trendy Pampelonne Beach in St. Tropez to the family friendly Ponteil Beach in Antibes, and the pebbley beaches east of Antibes towards Nice. A villa holiday in the French Riviera offers you the opportunities to both relax and unwind, and a perfect base to explore this diverse region.. The French Riviera, or Cotê d’Azur, lies in the south-east of France. The region runs from St Tropez in the west to the Italian border in the east, and stretches from the Mediterranean coast to the southern Alps. The city of Nice is situated along the coastline and is home to the region’s main airport. As the region is protected from the colder weather by the Alps, it tends to enjoy a mild climate. Daytime temperatures here rise to the mid-teens by the end of April, while summer begins in late May and lasts until the end of September. In July and August, daytime temperatures can rise to above 30 degrees Celsius. There are plenty of glamorous bars to be found in the larger towns and cities, such as St. Tropez, Cannes or Nice. The coastline is beautiful at sunset, and there are several rooftop bars where you can enjoy the view with a cocktail. It’s a quieter affair in the smaller towns and villages, with local restaurants and bars offering a more relaxed vibe. In the summer, the French Riviera plays host to several events. Attracting an array of international artists, the jazz festivals in Juan les Pins and Nice are a particular highlight. The region was originally known for its fishing, olive groves and the production of flowers for perfume, manufactured in Grasse. The French Riviera became popular in the early 19th century, when the wealthy European aristocrats and royalty began to arrive, including Queen Victoria who was very fond of the area. Quickly becoming the most popular destination amongst the world’s richest, you will still find luxurious villas, restaurants and super yachts here. By the end of the 19th century, several artists were attracted by the climate, bright colours and stunning scenery, including Auguste Renoir, Henri Matisse and Pablo Picasso. Many of the world’s famous artists came to the French Riviera to paint, and you can see their work displayed in museums throughout the region. Nice is home to 3 of the best art museums, including Musée Matisse, Musée Marc Chagall and Musée d’Art Morderne, all offering free entry on the first Sunday of every month. You will also find a number of cobbled towns and villages throughout the region, still showing signs of their medieval history. Home to the Fondation Maeght and the nearby La Chapelle du Rosaire (designed by Henri Matisse), the medieval town of Saint Paul de Vence is well worth a visit. Festivals are common in the French Riviera, from the Film Festival in Cannes, to the smaller town events such as the Fete du Jasmin every August in Grasse. There is an array of towns and cities to visit along the length of the Mediterranean coast, including the glamourous St. Tropez, Cannes, Antibes and Monaco. Cannes holds the annual Film Festival every May, while Monaco is home to the Grand Prix. Head north towards the Alps for the charming old villages of Grasse, Saint Paul de Vence, Gourdon and Biot. Packed with culture, these villages offer stunning views across the French Riviera from their high vantage points. Grasse is famous for its perfume industry and is home to the International Perfume Museum. Biot is known for glassblowing – you can visit The Glassblowers’ Studio for free to watch the masters at work. For spectacular landscapes, visit one of the 14 nature parks, each with a diverse range of flora and fauna. The capital of the French Riviera, Nice, is one of the liveliest cities in the region, with a historic Old Town and no end to shopping and dining spots. Famous for its culinary delights, the French Riviera is a food lover’s paradise. Choose from countryside restaurants serving local specialties, or head to the coastal towns for some delicious seafood. This area is well-known for the traditional niçoise salad – don’t leave without trying it. Most towns and villages will also hold a local food market where you can buy regional specialties like goat’s cheese and fougasse, as well as other fresh breads and local delicacies. Or, if you feel like blowing the budget, why not visit one of many Michelin Star restaurants in Nice or Cannes? With numerous vineyards in the region, there is plenty of French wine for you to enjoy too – you can find a wine to pair with every dish you try. The locally produced Provençal Rosé is a firm favourite amongst locals. The French Riviera is such a diverse region, offering a plethora of things to do for the whole family. Visit one of the many beaches along the coast, or head north to one of the 14 nature parks to explore the local flora and fauna. If you like to stay active on holiday you try can hiking, mountain biking and horseback riding. Don’t miss the Grottes de Saint-Cézaire too – a 3 mile long network of caves almost 40 meters underground. Or, drive to the Gorges du Loup canyon, where you can try canyoning and kayaking. There is an Aquarium in Monaco that offers a range of interactive activities for kids to enjoy. Just outside of St. Tropez you’ll find Azur Park, with over 35 attractions and rides, as well as a mini golf course. Antibes is home to Marineland, with a small zoo and aquarium, plus play park and miniature golf. For a fun day out, try Le Village des Fous which has a maze, water games and rides. You could also visit Le Bois de Lutins for its fun tree top adventure park. All Villa Plus villas in the French Riviera are individually selected to give you the perfect home from home. You can explore the region, or simply relax in your villa and make the most of your private pool. 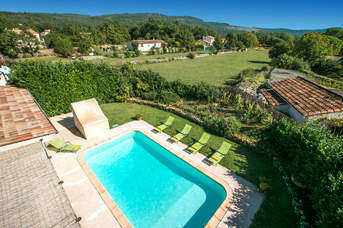 All our villas are located inland in the French countryside, within a 10 minute drive of the nearest town or village. You’ll have plenty of outside space to dine al fresco, or you can head to one of the local restaurants to sample some French cuisine. We’re on hand 24-7 to help you make the most of your fabulous French Riviera villa holiday. All our villas are located inland in the French countryside, within a 10 minute drive of the nearest town or village. They offer a fabulous base to explore the many small towns and villages in the French Riviera, dotted amongst the rolling hills and olive trees. Vidauban is a small wine-making village situated northwest of St Tropez. Surrounded by olive groves and vineyards, wine tasting is a must during your holiday in Vidauban, and there are a number of wineries you can visit. The village is centred around a square with a choice of open-air restaurants, a crêperie and cafés. St Cezaire sur Siagne has an imposing location set on the clifftops overlooking the River Siagne. Part of the Prealpes d’Azur Regional Natural Park, its elevated position offers stunning panoramic views of the Siagne Valley, olive groves and surrounding countryside. The village itself is a medieval collection of narrow lanes, small cafés and old houses, all centred around the 18th century church. 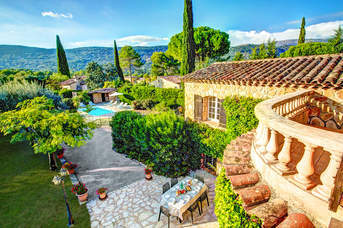 It’s a great place to rent a villa in the French Riviera. Peymeinade is a small village situated to the southwest of Grasse, featuring pretty stone houses and a 19th century fountain. The village is centred around the main high street, which has a selection of restaurants, bars and shops, as well a small children’s playground. If you’re feeling active, there’s also a sports complex with tennis courts. With stunning natural landscapes and a rich cultural history, the French Riviera has so much for your to discover. Explore the coasts and take a boat trip from Cannes to St. Tropez, or go underground to see the Grottes de Saint Cezaire cave network. Located on the outskirts of Biot village, La Verrerie de Biot offers you the opportunity to discover more about the glass blowing that this region is famous for. Learn about the history of the industry and watch live demonstrations from experienced glassblowers. Visit between 10:00 to 12:00 or 14:30 to 18:00, Tuesday to Saturday, and you can even blow and make your own piece. There is also a shop onsite where you can purchase some beautiful pieces to take home with you. Located in the Pays du Grasse is a 3 mile long network of caves nearly 40 metres underground. A section of this network is open to the public between February and November, where you can walk through with a guide and see the starry concretions and luminous jellyfish. Your guide may even do a sound show for you on musical stalactites! There is also a nature walk and a high rope adventure course onsite. Set in Gourdon, the Gorges du Loup is a narrow canyon with beautiful scenery and clear waterfalls. There are walkways and paths along the river, or for the more adventurous you can try canyoning and kayaking. Some of the walkways and paths can be steep and slippery so be sure to bring sturdy footwear. Cannes is famed for its glamorous luxury yachts, but you can also arrange several fun boat trips departing from the harbour. Enjoy a sunset cruise around the old port of Cannes, or why not make a day of it and take a boat over to St. Tropez or Monaco? Stretching along the Mediterranean coastline, there is a huge range of beaches in the French Riviera. Towards the east and in Nice itself you will find mainly pebbly beaches, but head west of Antibes and you will soon come across larger sandy stretches. Private beach clubs are common in towns like Cannes and St. Tropez – perfect for a day of luxury! There are also plenty of family friendly options along the coast too. Most French Riviera beaches have amenities like beach bars, cafes and lifeguards, but some smaller coves are without any facilities. Plage Fréjus is a wide sandy beach stretching for over 1000 yards to Port Fréjus. There is a promenade behind where you will find a few restaurants and cafes, and toilet and shower facilities are also available. Sunbeds and parasols can be hired from the private La Plage beach club, which also features an on-site restaurant. Located on the coast between Cannes and Frejus, Plage d’Agay is a long shingle beach. Set in a sheltered bay, the calm waters are great for swimming and you can also rent stand-up paddleboards and boats. There are restaurants and coffee shops on the road behind the beach, and toilet facilities are available. Long Beach, run by the Marriott Hotel, is a trendy private beach club located along the Croisette Boulevard in Cannes. There are sun beds and parasols to rent on the sand itself, plus a beach bar with table service. You will also find the Long Beach Restaurant situated on decking at the top of the beach, with comfortable seating and covered dining tables and chairs. This is a great spot to treat yourself to a bit of luxury, and enjoy some people watching! Located in a bay in Antibes, this is a long, white sand beach that stretches over 1000 yards from the Royal Beach Club to Antibes Yacht Club. Lifeguards are on duty throughout the summer months, and the water is shallow for some distance, making this a perfect choice for families. There is a food kiosk for sandwiches and snacks, or behind the pedestrian promenade that lines the beach you will find a couple of restaurants as well as supermarket selling ice creams. At the Yacht Club you can also rent kayaks and paddleboards, or even learn to sail. France is a food lover’s paradise, known all over the world for its fabulous cuisine and fine wines. Due to the vast area the region covers, the French Riviera offers everything from delicious seafood in the harbour towns to hearty pasta dishes in the countryside hills. You are sure to find something to suit all taste buds. 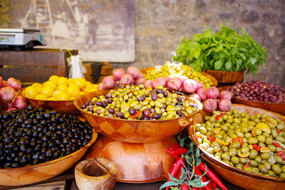 Almost every town in the French Riviera will host a weekly market offering a wide selection of local produce. The markets will usually start in the mornings and are finished around lunchtime. 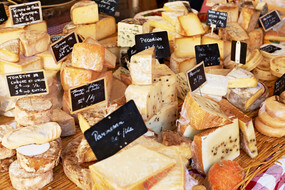 Smaller villages will mainly have fruit, vegetables and breads, but head to the large towns such as Cannes or Antibes and you will discover a stunning display of cheeses, breads, flowers and even souvenirs. Due to its location on the Mediterranean coast, many of the speciality dishes in the French Riviera feature fresh seafood and seasonal fruit and vegetables grown locally. The olive tree is part of the landscape throughout the region, harvested in winter to produce the olive oil used in almost every dish. Of course, all the local dishes pair nicely with a glass or two of French wine. 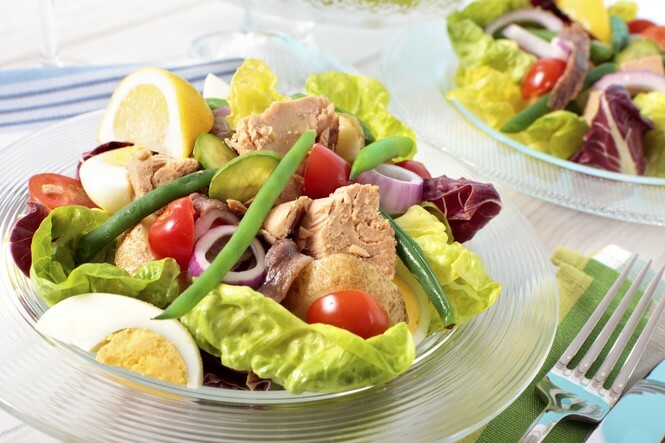 Niçoise Salad – Originating in Nice and now known all over the world, the niçoise salad is a great lunch or dinner option. Recipes can vary, but the main ingredients include tuna, hard-boiled eggs, black olives and anchovies served with lettuce leaves. Salade de Chevre – Another salad popular in the region is this goat’s cheese salad, served with walnuts, olives and locally sourced honey. Soupe de Pistou – Often served as a starter, soupe de pistou is a local soup made with a basil and olive oil sauce. 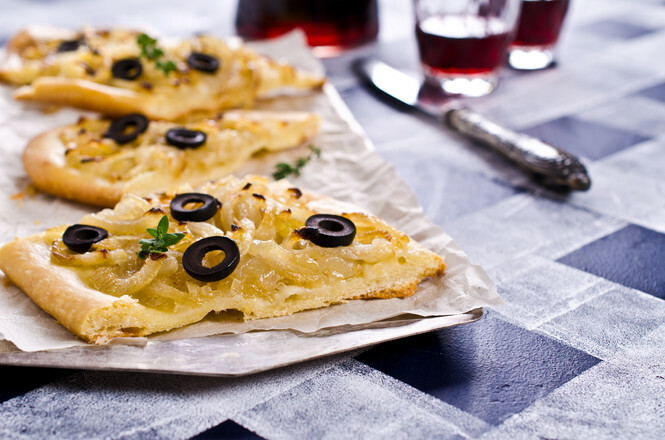 Pissaladière – Sometimes confused with a pizza, a pissaladière is a savoury onion tart layered with olives, anchovies and local herbs. Great for lunch or even just a snack. Daube Provençale – For a heartier dish, try this beef stew with vegetables simmered in red wine. Seafood – As you would expect, there is an abundance of seafood to sample in the French Riviera. The fish is simply grilled with herbs and served with pasta or potatoes. A firm favourite is Moules-Frites – mussels with chips! Cheese – In France, the cheese is always served before dessert, and the French Riviera offers a fabulous selection of delicious cheeses. The goat’s cheese is popular with locals, and there is a variety to choose from, varying from soft and creamy to quite hard. Wine – France is renowned for its fabulous wines, and there is no shortage of vineyards throughout the French Riviera, with a choice of wineries for you to visit. The area is known for its Provençal Rosé, which is a firm favourite with the locals. This recipe will serve 6 people, but quantities can easily be adjusted. Rub your serving dish with the glove of garlic. Hard-boil the eggs and put them into cold water before peeling them. Peel and cut tomatoes into quarters, removing excess seeds. Thinly slice the green pepper and spring onion. Assemble with lettuce leaves, flaked tuna, hard-boiled eggs (sliced or quartered), green peppers, anchovies and black olives. Drizzle a little olive oil and keep refrigerated until ready to serve. Melt the butter over a medium heat. Add the onions and demerara sugar and sauté, frequently stirring, until they become tender. Sprinkle with salt, pepper and thyme, and transfer to the preheated oven. Cook for 20-30 minutes, occasionally stirring, until the onions are soft and golden in colour. Add the vinegar during the last 5 minutes of cooking. Remove the onions from the oven and set them aside to cool while preparing the pastry for the pissaladière. Raise the oven temperature to 220 degrees Celsius. Roll the puff pastry into a 12x18 inch rectangle, and spread with the onion confit, leaving 1 inch of dough uncovered around the edges of the pastry. Arrange the anchovy fillets and olives on the top of the onions. Bake the tart for 15 to 25 minutes until the pastry has puffed up and turned golden. Cut the pissaladière into small squares before serving.